When I think of summer I think of time spent outdoors and summer fresh food like fruits, vegetables and a plethora of summer salads. When I’m not outside, I’m spending summer days in the kitchen canning tomatoes, making potato salad, cutting up watermelon, and more. I like to keep my kitchen bright and airy through the warmer months of the year. My Summer Inspiration Decor always involves bringing flowers from the garden into my farmhouse. 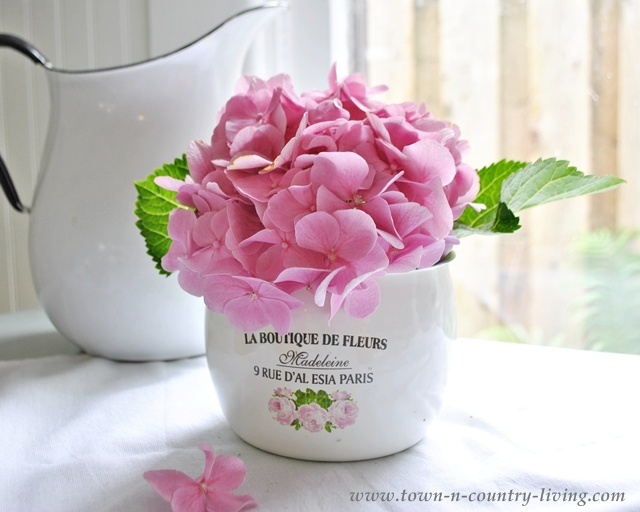 I’ve placed pink hydrangeas around the kitchen and set 3 of them in mason jars in the kitchen windows. Pink Hydrangeas add pops of summer color in the kitchen. We recently added the open shelving in the kitchen and I’m having fun loading it up with white ironstone. 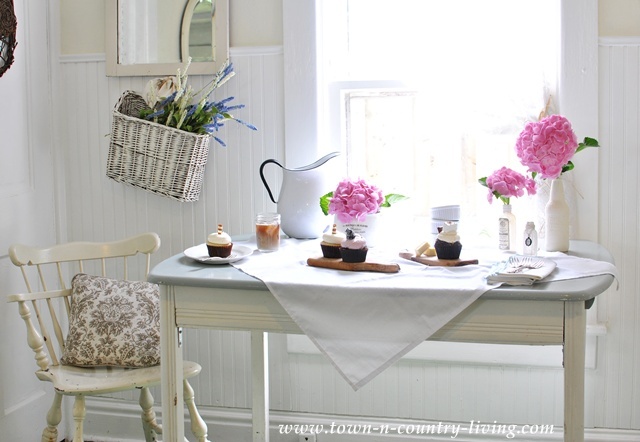 In the dining nook of my farmhouse kitchen, I’ve set a table for an afternoon summer snack. I know I was talking about fruits and vegetables earlier, but I always have a soft spot for a pretty cupcake and a cool glass of iced coffee. 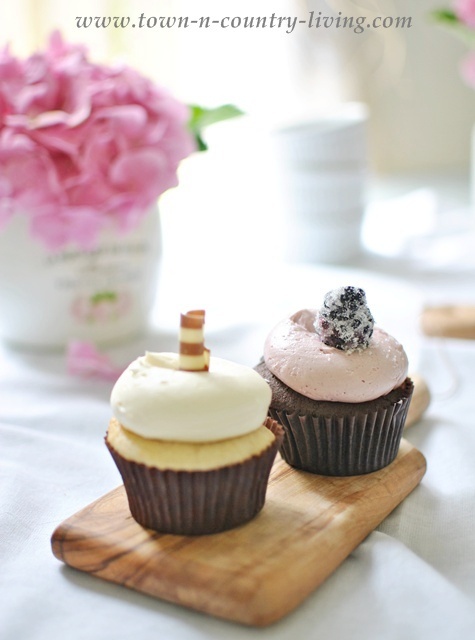 There’s a new cupcake and dessert bakery not too far from where I live called The Sugar Path. Their confections are always picture perfect and taste so yummy too! I’m so glad they opened up shop. A Lady Jane cupcake is on the left while Blackberry Syrah is on the right. They’re both fabulous! 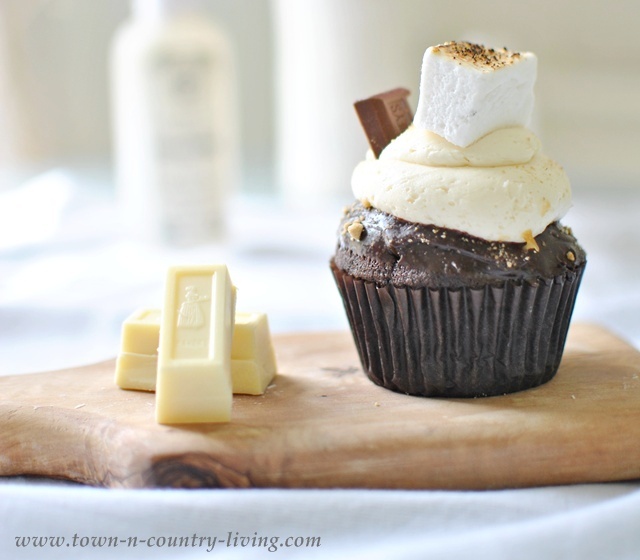 And this one … is a S’mores Cupcake that’s amazingly tasty and almost too perfect to eat! 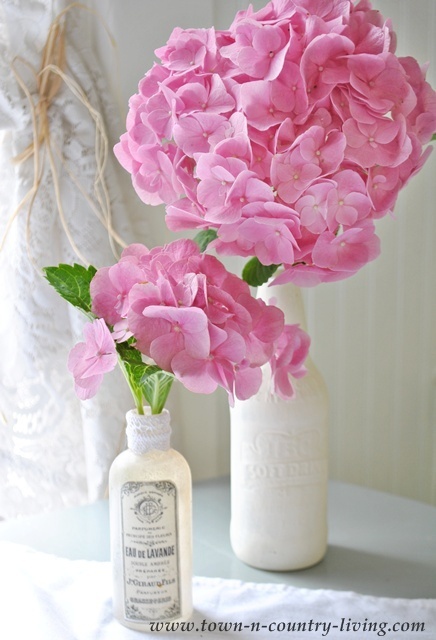 More pink hydrangeas provide Summer Inspiration Decor on the farmhouse table. I found a French enamel pot to hold one of these beautiful summer flowers. 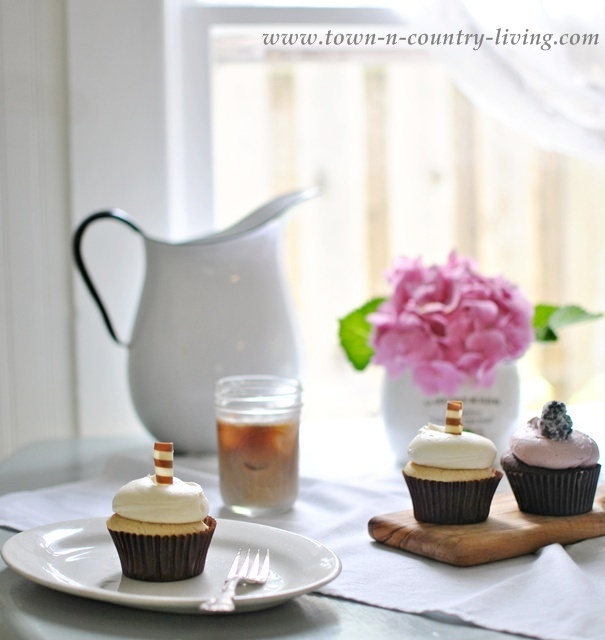 Would you like to pull up a chair and join me for a pretty cupcake and glass of iced coffee in my farmhouse kitchen with its summer inspiration decor? If you haven’t entered yet, I’m giving away a $150 gift card. You can enter through June 28th – scroll to the end of the giveaway blog post for the Rafflecopter entry form. your home just feels so summery and sweet. I love it, very charming. Thanks for the fun party! Your kitchen is absolutely beautiful! 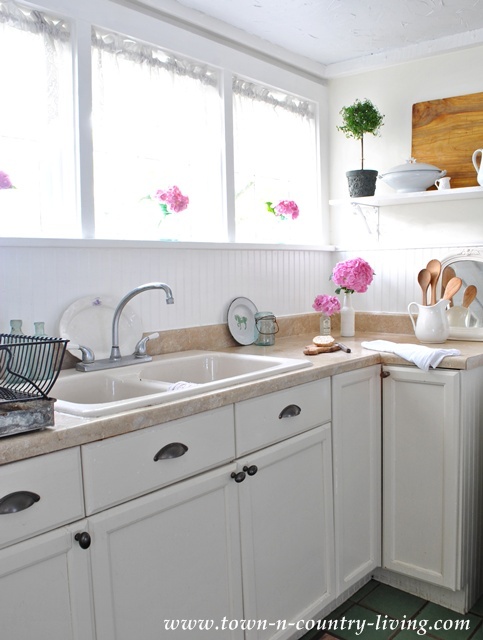 I always love seeing photos of your charming kitchen!! Thank you for hosting this great summertime party. 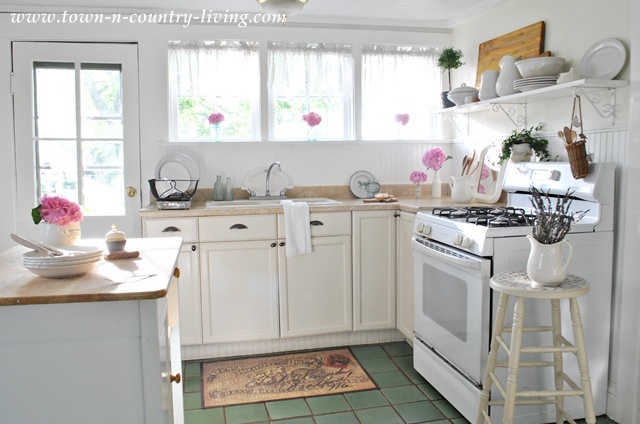 Love this new theme which is so perfectly introduced and shown with your own charming kitchen! Thanks for hosting and hope you have a wonderful weekend! Thanks for hosting the party! Should be lots of fun! I always enjoy seeing your kitchen decor. Oh my those cupcakes look so yummy!! Great styling by the way!! Jennifer, your kitchen is fantastic and the pink hydrangeas really want to come to my house! Thanks for the party. Thanks for hosting such a sweet party. Love your kitchen how bright and cheery it is. Iced coffee and a s’mores cupcake? Yes, please! Your kitchen is breathtakingly gorgeous! 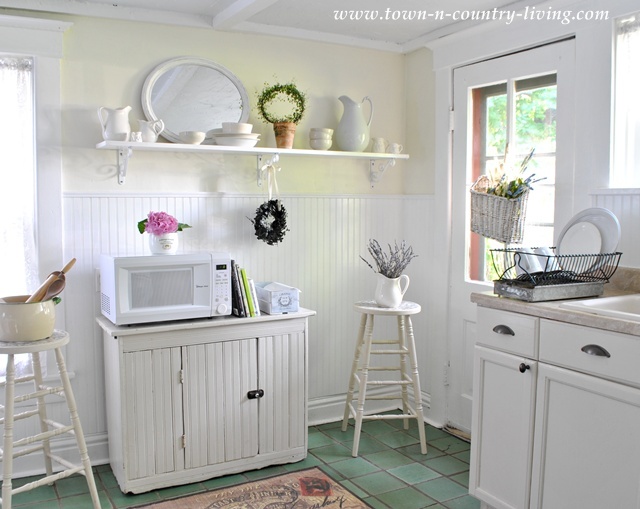 I love the bead board and the window trim. Thanks for hosting the party, Jennifer! Thanks for hosting this fun party. It inspired me to get my 4th of July decor out. Looks like summer has arrived at your house. Oh my…those cupcakes look soooo yummy:) Thanks for hosting this summer party. Is that your kitchen! I think I might weep with joy if that were my kitchen! I think it all looks very pretty and fresh. I really like the colors in the floor. Your kitchen is gorgeous. Very beautiful and peaceful. Oh my! I will be dreaming about that s’mores cupcake! 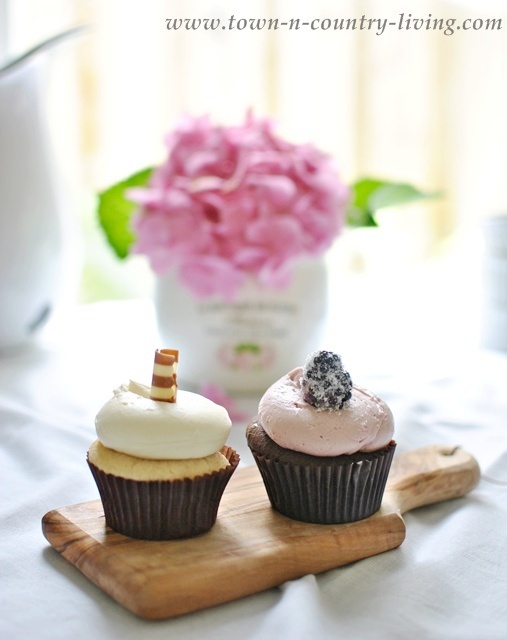 Love looking at your kitchen anytime but add in hydrageas and cupcakes and iced coffee….heaven!! Your kitchen is lovely, and yes, I’d love to join you at that sweet little table…everything has such a clean, comfortable feel to it. 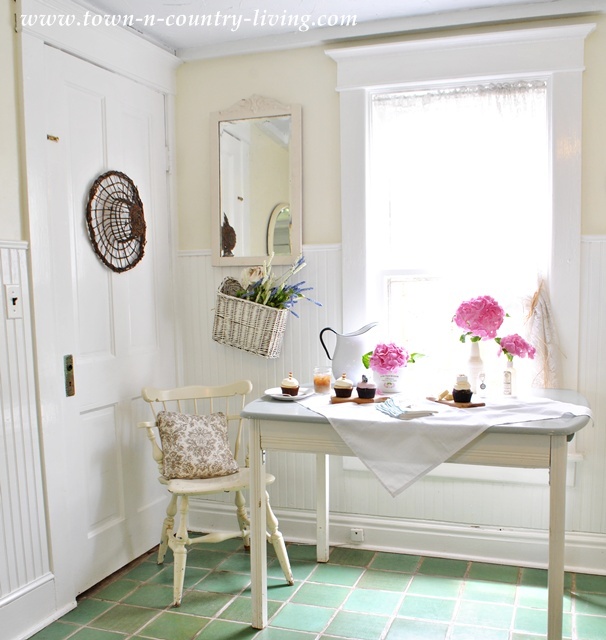 I love the green tile floor as well and all of your accents…perfect!